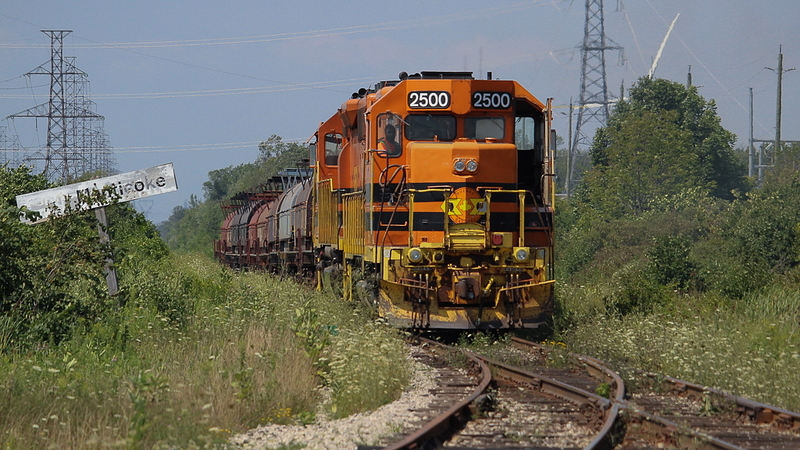 Railpictures.ca - James Knott Photo: With my plans to chase GEXR today gone with this snowstorm, I thought I’d post a flashback to a hot summer’s day. Humidex values were well into the 30s on this August afternoon, and just like pretty much every other day this past summer, the SOR crews had the door wide open trying to find any relief from the heat they could. I never did get to see a true Nanticoke steel train, and something like this is probably about as close as I will ever get to anything resembling one. SOR dropped the refinery traffic north of concession four for their ESSO switchers to lift, and proceeded south with QGRY 2500 and RLHH 3404 towing a string of coil cars for Stelco. The heat and sun were a bit too much this day and I called it once they entered the gates to Stelco. | Railpictures.ca – Canadian Railway Photography – photographie ferroviaire Canadienne. Caption: With my plans to chase GEXR today gone with this snowstorm, I thought I'd post a flashback to a hot summer's day. Humidex values were well into the 30s on this August afternoon, and just like pretty much every other day this past summer, the SOR crews had the door wide open trying to find any relief from the heat they could. I never did get to see a true Nanticoke steel train, and something like this is probably about as close as I will ever get to anything resembling one. SOR dropped the refinery traffic north of concession four for their ESSO switchers to lift, and proceeded south with QGRY 2500 and RLHH 3404 towing a string of coil cars for Stelco. The heat and sun were a bit too much this day and I called it once they entered the gates to Stelco.